After years of making ice cream, I splurged on this pricier option. Because it has a compressor, you can make back-to-back batches without needing to freeze the insert. It's bigger and heavier than the cheaper model, but it's so convenient if you make a lot of ice cream. I used this economical model for years. You have to plan ahead a day and place the freezer bowl in the freezer for 24 hours before making ice cream. It works great! I love these for storing homemade ice cream in the freezer. They keep the ice cream fresher, and it stays frozen longer when it's out of the fridge. This is my go-to mixing bowl. Love the handle and lid for fridge storage, when needed. This is another tool that gets lots of use in my kitchen. I used the 10" whisk for the ice cream base mixture and the smaller 6" whisk (link below) for combining the corn starch and milk. 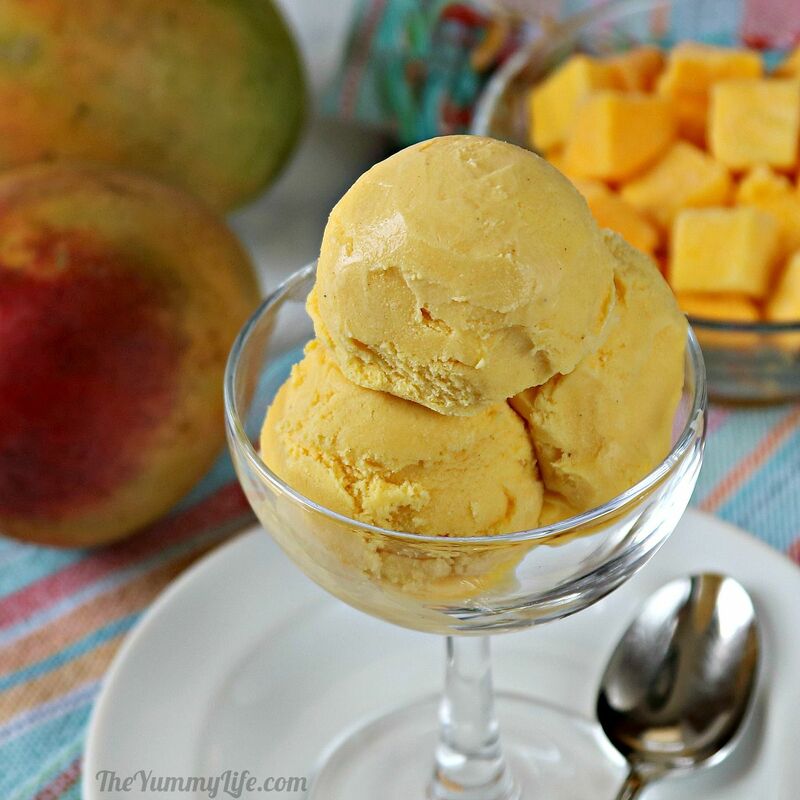 This mango ice cream has a creamy, smooth texture and beautiful color. A hint of cardamom and cinnamon elevate the flavor for a yummy frozen treat. MAKE ICE CREAM BASE: In small bowl, mix 1/4 cup milk with cornstarch; set aside. 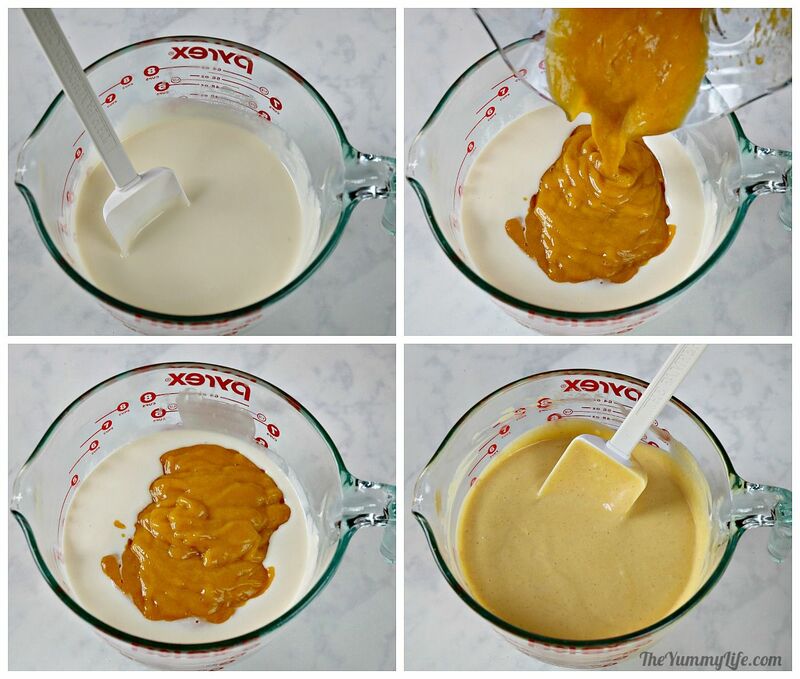 In 5 quart pan, combine remaining 1-3/4 cups milk, cream, sugar, corn syrup, vanilla extract and salt. On medium-high heat bring mixture to rolling boil. Boil for 4 minutes, stirring occasionally. Remove from heat and whisk in the corn starch/milk slurry. Return to heat and continue to stir for 1-2 minutes; it will thicken slightly. Remove from heat. Add cream cheese to a large mixing bowl and stir with a rubber spatula, pressing cream cheese against sides of bowl until it is is smooth. 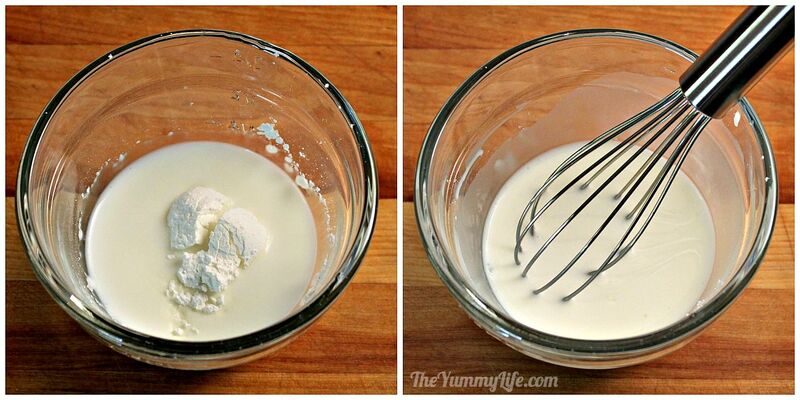 Add 1/2 cup hot ice cream base liquid to cream cheese & whisk until smooth. Gradually add and stir in remaining hot mixture; whisking until smooth after each addition. 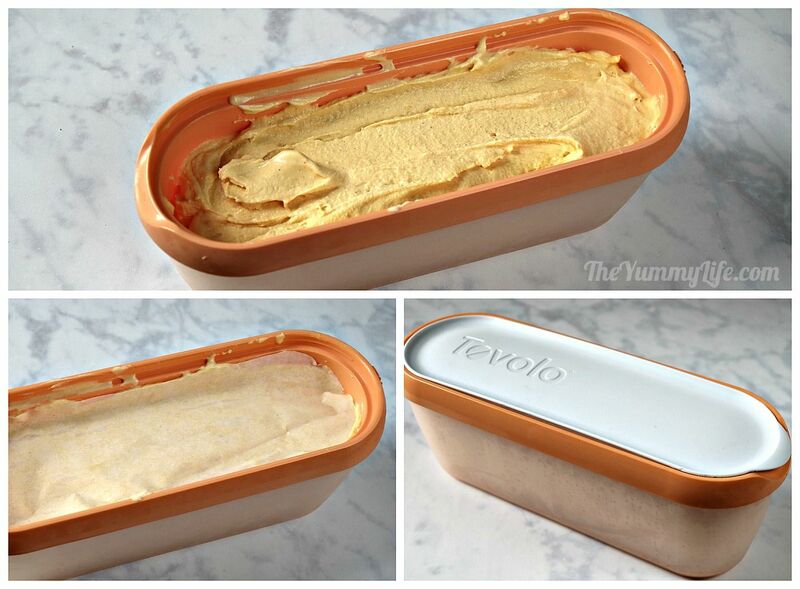 Cover and refrigerate while you make the mango puree. MAKE MANGO PUREE: In a nonreactive bowl, combine mangoes, lemon juice, sugar, cinnamon, and cardamom; stir to evenly mix. Cover and let sit for 2 hours at room temperature. Transfer to blender and puree until smooth. 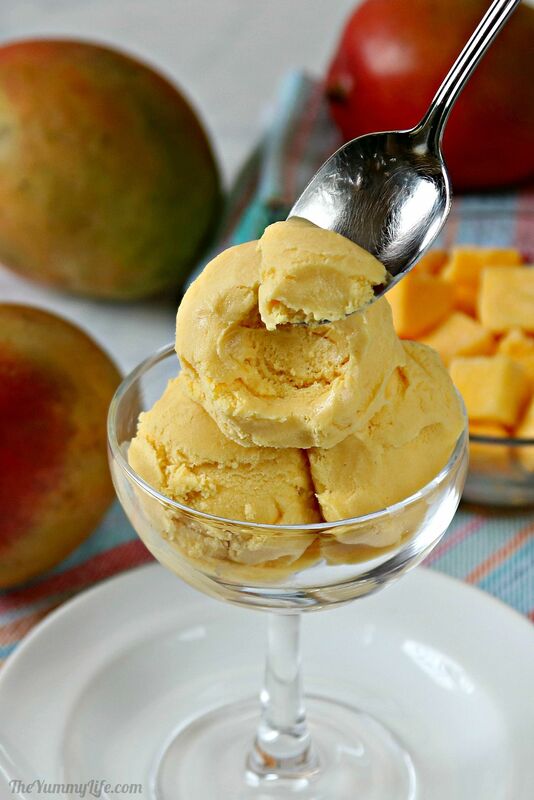 COMBINE PUREE AND ICE CREAM BASE: Remove ice cream base from refrigerator, add mango puree and stir to combine. Cover and refrigerate 6-8 hours until completely chilled. * May be made and refrigerated up to 3 days before making ice cream. *TO QUICK CHILL mixture for making ice cream right away: Fill large bowl 3/4 full with ice cubes and add water. Pour hot milk mixture into 1 gallon freezer Ziploc bag, seal and immerse in bowl of ice water for at least 30 minutes until mixture is completely chilled; add more ice as needed. TO FREEZE ICE CREAM: Pour chilled mixture into ice cream freezer and freeze according to instruction of your ice cream maker. (Note that this makes 1.5 quarts. For 1 quart ice cream freezers, make in 2 batches.) When finished, transfer frozen ice cream to a plastic container and press a sheet of parchment paper on top. Cover and freeze for at least 4 hours until firm. If it's frozen too hard to scoop, let ice cream soften at room temperature for 5-10 minutes before scooping and serving. Mangoes have been increasing in popularity in the U.S. in recent years, and for good reason. When they are ripe, their juiciness and flavor are simply wonderful. While I was recently enjoying an amazing culinary tour of India with Delectable Destinations, I was delighted to find mangoes in some form on almost every menu. During my travels there, I regularly enjoyed mango yogurt for breakfast and mango ice cream for dessert. I couldn't get enough! 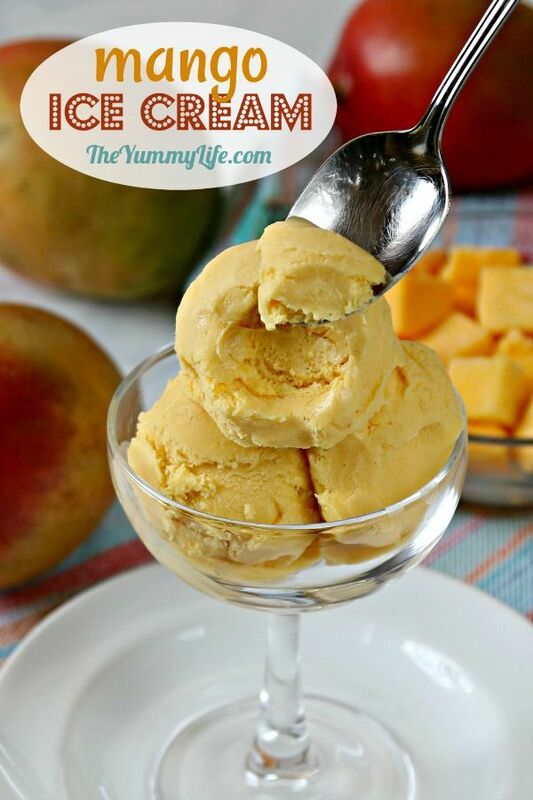 When I got home from India, I immediately tried making mango ice cream. It turned out to be easy to simply add mango to my vanilla ice cream recipe. So good! I add a hint of cardamom--a popular spice in Indian cooking that perfectly complements and elevates the flavor of mango. Step 2. In a small bowl, whisk together cornstarch and milk. Set aside. Step 3. 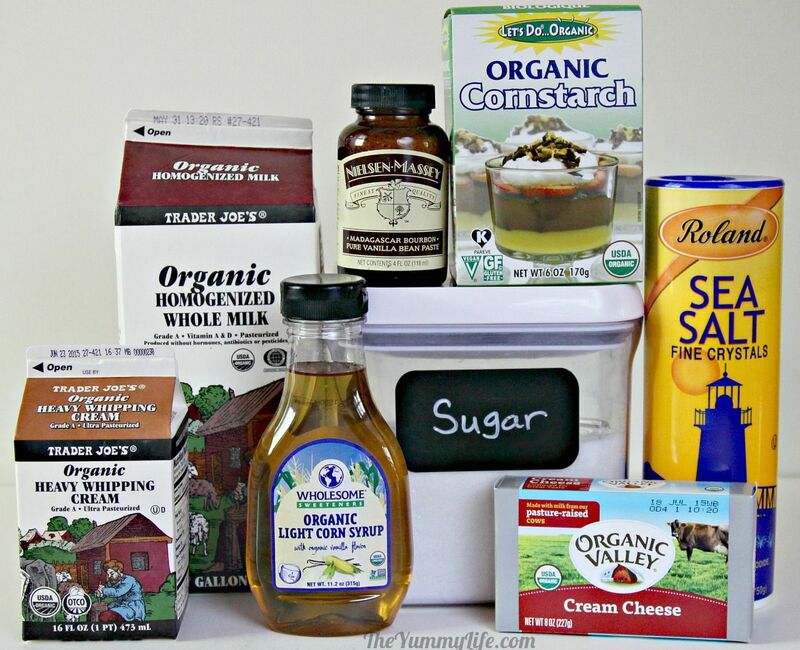 In large pan on stove top, combine remaining milk, cream, sugar, corn syrup, vanilla extract and salt. On medium-high heat bring mixture to rolling boil. Boil for 4 minutes, stirring occasionally. 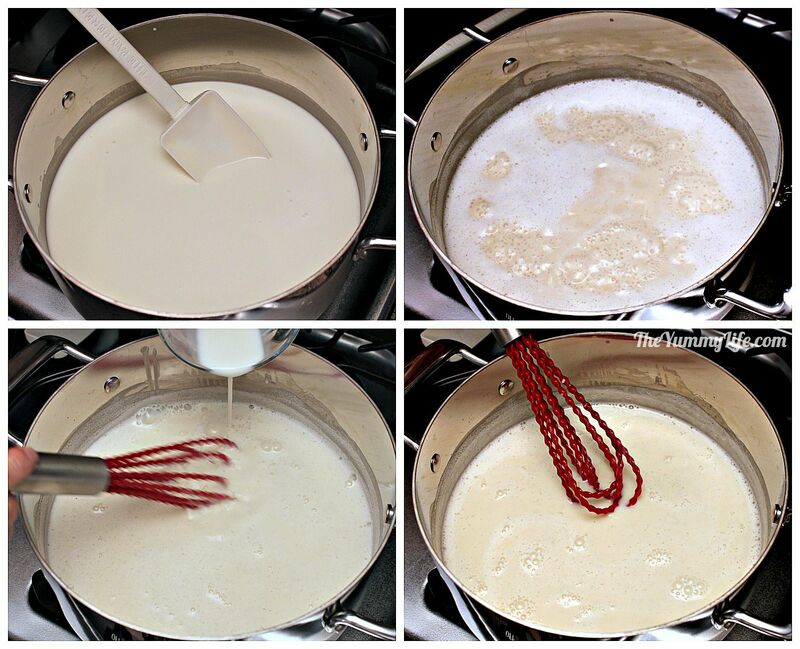 Remove from heat and whisk in the corn starch/milk slurry. Return to heat and continue to stir for 1-2 minutes; it will thicken slightly. Remove from heat. Step 4. Add cream cheese to a large mixing bowl and stir with a rubber spatula, pressing cream cheese against sides and bottom of bowl until it is smooth. 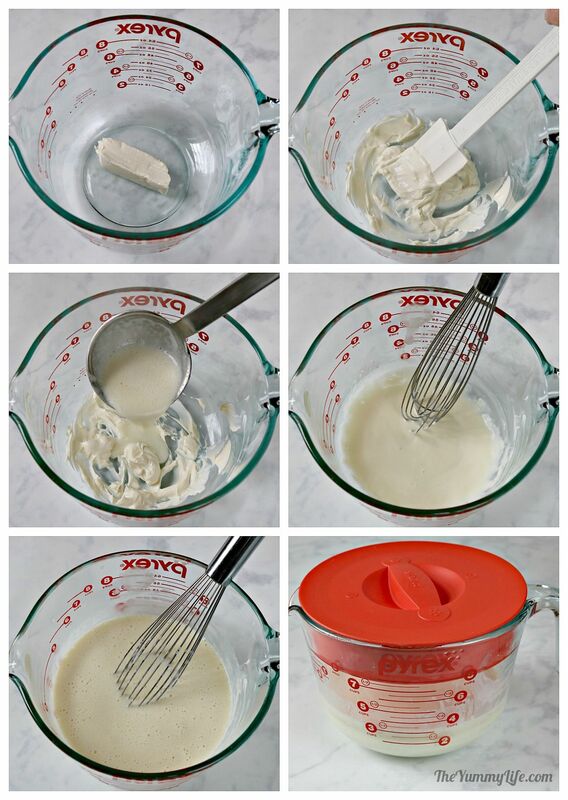 Gradually add hot ice cream base liquid to cream cheese, whisking until smooth after each addition. Cover and refrigerate while you make the mango puree. Step 5. Make mango puree. In a nonreactive bowl, combine mangoes, lemon juice, sugar, cinnamon, and cardamom; stir to evenly mix. Cover and let sit for 2 hours at room temperature. Transfer to blender and puree until smooth. Step 6. 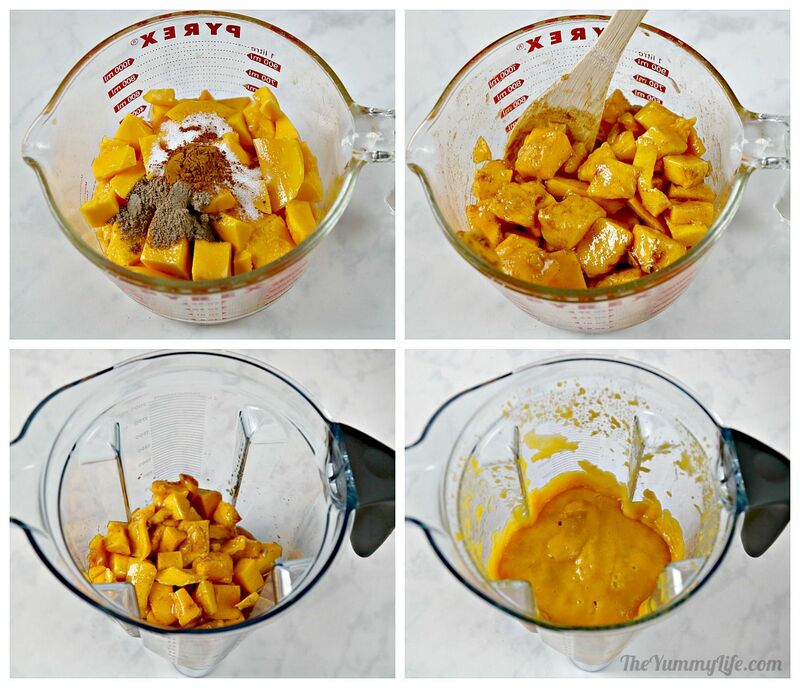 Remove ice cream base from refrigerator, add mango puree and stir to combine. Cover and refrigerate 6-8 hours until completely chilled. May be made and refrigerated up to 3 days before making ice cream. TIP: To quick chill mixture for making ice cream right away: Fill large bowl 3/4 full with ice cubes and add water. Pour hot milk mixture into 1 gallon freezer Ziploc bag, seal and immerse in bowl of ice water for at least 30 minutes until mixture is completely chilled; add more ice as needed. Step 7. Pour chilled mixture into ice cream freezer and freeze according to instruction of your ice cream maker. NOTE: this recipe makes 1.5 quarts. For 1 quart ice cream freezers, make in 2 batches. 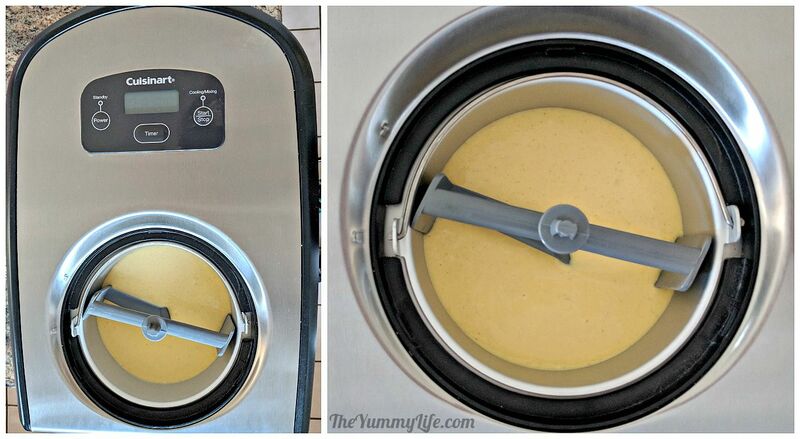 Cuisinart 2-quart Automatic Ice Cream Maker -- I used this economical model for years. You have to plan ahead a day and place the freezer bowl in the freezer for 24 hours before making ice cream. It works great! Cuisinart 1.5 quart Compressor Ice Cream Maker (pictured below) -- After years of making ice cream, I splurged on this pricier option. Because it has a compressor, you can make back-to-back batches without needing to freeze the insert. It's bigger and heavier than the cheaper model, but it's so convenient if you make a lot of ice cream and want to make multiple consecutive batches. 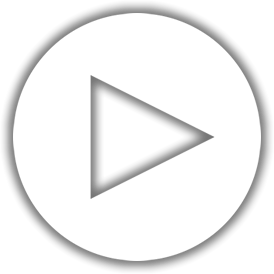 Your browser does not support playing videos on The Yummy Life. NOTE: Ice cream may appear a bit grainy at this point, but it will be smooth and creamy after it's been in the freezer awhile. Step 8. Transfer frozen ice cream to a plastic container and press a sheet of parchment paper on top. Cover and freeze for at least 4 hours until firm. If your ice cream freezes too hard to easily scoop, let it soften at room temperature for 5-10 minutes before scooping and serving.